The properties of thin films consisting of amphiphilic molecules grafted to the air water interface are investigated with a Langmuir Trough. This is a trough made of teflon. A moveable barrier seals one side of the water surface, so the moleculear area can be varied. A known amount of amphiphilic molecules  is disolved in a spreading solvent . A few microliters of the solution are dripped onto the water with a micro syringe. The solvent evaporates and a welldefined amout of amphiphiles remains on the surface. A simple parameter of the system is the surface tension g. It is measured as the force acting on a plate or paper. The surface tension of a clean water surface at room temperature is gWater=72.4mN/m. Surface active molecule reduce the surface tension. The difference P=gWater-g is called lateral pressure. 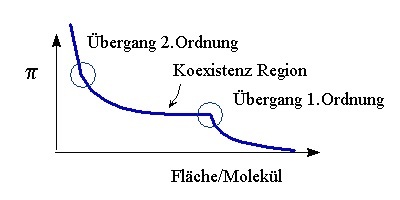 The repulsion between the amphiphilic molecules decreases the surface tension with decreasing area per molecule, that means an increase in lateral pressure - analogous to 3d systems. Correspondingly one measures isotherms in the area pressure diagramm for thermodynamic characterization. Surface experiments are threatenend by even tiny concentrations of impurities. Hence experiments on a langmuir trough are mainly: Cleaning. Repeated filling with water of high purity, followed by sucking off, after application of tensid or propanol solutions and wiping with solvents takes most of the time. The measurenment itself on the other hand is mainly computer controlled and requires little attention. Amphiphilic molecules consist of water loving, i.e. polar or ionic, and a water repelling, nonpolar part. A simple example are fatty acids. 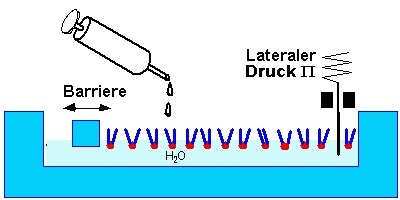 In experiments on a langmuir trough the molecule must be bound to the surface, at least metastable. This requires little or no solubility in water, achieved by a sufficently large hydrophobic part. A solvent spreads, if the surface energy of the air/water interface is larger than the surface energies of the solvent/water and the solvent/air interfaces together. In this case the thin film formation is energtically favoured. The spreading of this film also distributes the molecules on the surface. A typical solvent is chloroform or mixtures of chloroform with small shares of polar molecules (methanole, ethanole). These additives increase the solubility of amphiphil molecules.